Today is Bhagavad Gita Jayanti. Which means today is the day when Bhagavad Gita was spoken by Lord Shri Krishna to his very first disciple in the form of human i.e. Arjun. Tomorrow Bhagavad Gita will complete 5151 years. Why is the Bhagavad-Gita called a song if it is spoken? What is the name of this rhyming meter? Who originally spoke the Bhagavad-Gita? Lord Krishna originally spoke the Bhagavad-Gita. Where was the Bhagavad-Gita originally spoken? Why is the land of Kuruksetra so holy? Where is the Bhagavad-Gita to be found? What is the historical epic Mahabharta? Vedavyasa is the divine saint and incarnation who authored the Srimad Bhagavatam, Vedanta Sutra, the 108 Puranas, composed and divided the Vedas into the Rik, Yajur, Artharva and Sama Vedas, and wrote the great historical treatise Mahabharata known as the fifth Veda. His full name is Krishna Dvaipayana Vyasa and he was the son of sage Parasara and mother Satyavati. Why is the Mahabharata known as the fifth Veda? What are the special characteristics of the Mahabharata? What about the Aryan invasion theory being the source of the Bhagavad-Gita? What is the size of the Bhagavad-Gita? The Bhagavad-Gita is composed of 700 Sanskrit verses contained within 18 chapters, divided into three sections each consisting of six chapters. They are Karma Yoga the yoga of actions. Bhakti Yoga the yoga of devotion and Jnana Yoga the yoga of knowledge. When was the Bhagavad-Gita spoken? The Mahabharata confirms that Lord Krishna spoke the Bhagavad-Gita to Arjuna at the Battle of Kuruksetra in 3137 B.C.. According to specific astrological references in the Vedic scriptures, the year 3102 B.C. is the beginning of kali yuga which began 35 years after the battle 5000 years ago. If calculated accurately it goes to 5151years from today. What is the opinion of western scholars from ancient times? When was the Bhagavad-Gita first translated into English? The first English edition of the Bhagavad-Gita was in 1785 by Charles Wilkins in London, England. This was only 174 years after the translation of the King James Bible in 1611. Was the Bhagavad-Gita also translated into other languages? Yes. The Bhagavad-Gita was translated into Latin in 1823 by Schlegel. It was translated into German in 1826 by Von Humbolt. It was translated into French in 1846 by Lassens and it was translated into Greek in 1848 by Galanos to mention but a few. What was the original language of the Bhagavad-Gita? The original language of the Bhagavad-Gita was classical Sanskrit from India. 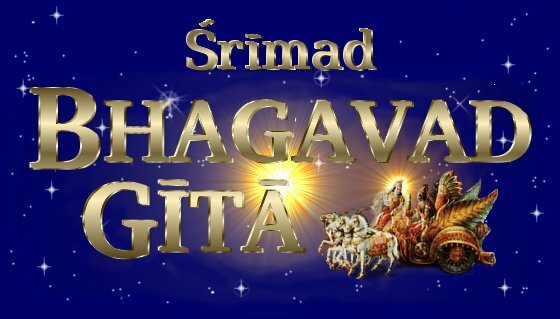 Why is Srimad often written before the Bhagavad-Gita? The word Srimad is a title of great respect. This is given because the Bhagavad-Gita reveals the essence of all spiritual knowledge. Is history aware of the greatness of Srimad Bhagavad-Gita? Historically many very extraordinary people such as Albert Einsten, Mahatma Gandhi, Dr. Albert Schweitzer, Herman Hesse, Ralph Waldo Emerson, Aldous Huxley, Rudolph Steiner and Nikola Tesla to name but a few have read Srimad Bhagavad-Gita and were inspired by its timeless wisdom.